The Broiler Feed Masterclasses were held on the day after the two Broiler Feed Quality Conferences in Bangkok and Jakarta. About 50 delegates from 12 countries participated in each program. A classroom format was designed to create a more interactive environment. Poultry nutrition consultant Tim Walker and Spesfeed (Pty) Ltd’s Rick Kleyn, supported by three industry specialists from AB Vista, Adisseo and Evonik, led aa in-depth discussion on broiler feed and nutrition. Dr Walker spoke on energy, nutrients and minerals to participants. 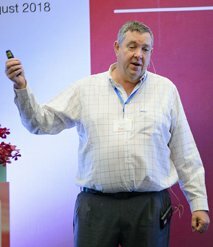 Meanwhile Dr Kleyn presented his thought on energy and protein in poultry diets from commercial nutritionist’s perspective, and matrix and feed specifications considerations when using multiple enzymes. Adisseo Asia Pacific’s Lihong Zhang talked about assessing ingredients like corn and corn dried distillers’ grains, soybean meal and analysis of total and phytic phosphorus via near-infrared reflectance system. Jae Choel Kim from AB Vista Asia Pte Ltd in Singapore elaborated on grain apparent metabolisable energy and reactive lysine. Lastly, Pradeep Krishnan, Technical Service Manager at Evonik SEA, talked about developing effective nutritional strategies and quality control. Ultimately, the masterclass aimed to help participants gain more in-depth understanding about nutrients to be included in the nutrient matrix in feed formulation systems. It also intended to unveil the importance of accurate and current nutrient values when creating and maintaining nutrient matrix.